glides down an airport escalator surrounded by song. Shortly After His Arrival At The Los Angeles Temple, disciples arranged for a meeting between Srila Prabhupada and Dr. John B. Orr (Chairman of the Department of Religious Studies, University of Southern California), Dr. Stillson Judah (Chairman of the Department of Phenomenology and History of Religion, and head librarian at the Graduate Theological Union, Berkeley, California), Dr. John P. Crossley (University of Southern California), Dr. Mize (Long Beach City College), and other scholars from various universities. 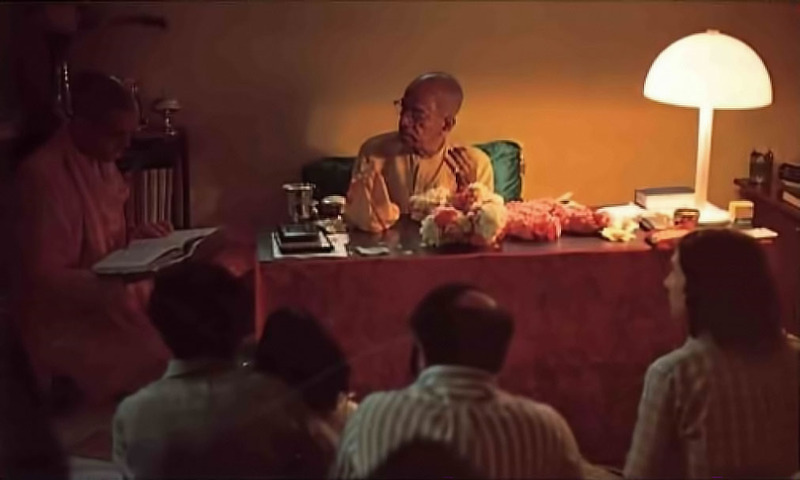 After all the guests had assembled and were seated comfortably in a small garden within the Los Angeles temple complex, Srila Prabhupada walked in with a quick step, sat down before them, and began to speak. Teaching the Teachers. West Coast scholars listen as His Divine Grace reveals the essence of Vedic knowledge. “All the revealed scriptures indicate that having achieved the human form of life, we should now find out what God is. That is real science—to inquire about the problems of life. And what are those problems? The real problems are birth, death, old age and disease. Prabhupada finished his brief talk and the guests were introduced to him. A lively conversation ensued that continued late into the evening. After His Four-Day Visit To Los Angeles, Srila Prabhupada traveled to Denver, where a family of devotees was pleased to give their house, right across the street from the temple, for their spiritual master to live in during his visit. 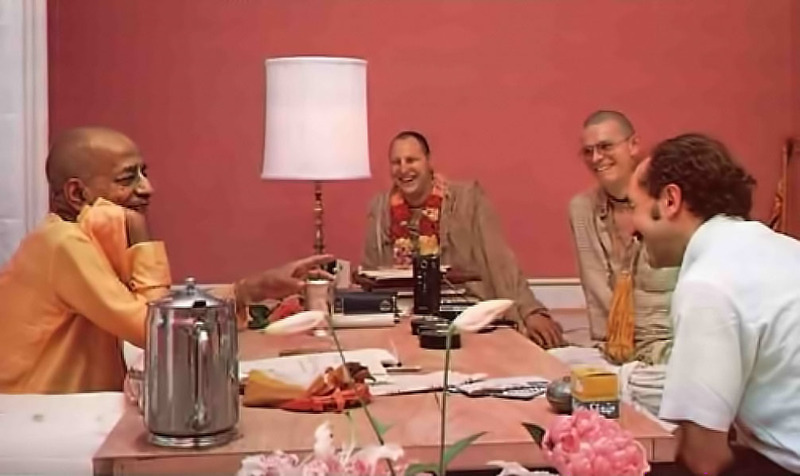 There Prabhupada would have mock debates with his sannyasi (renounced) disciples, showing them how to defeat other philosophies. 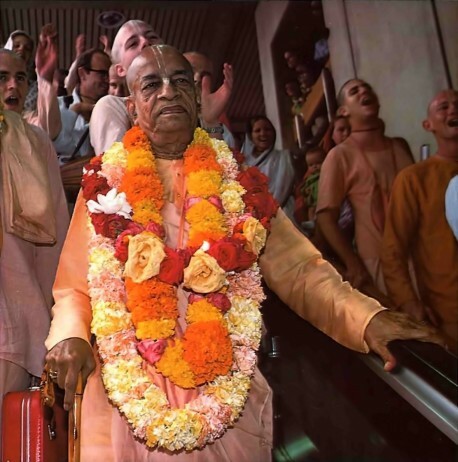 Prabhupada: What is the meaning of the Absolute Truth? Devotee: That from which everything emanates. Prabhupada: So everything must have come from something. No one can deny that. Now if you know what the Absolute Truth is we challenge you to present it. Devotee: We agree that there is an Absolute Truth, but we cannot at this time say exactly what it is. 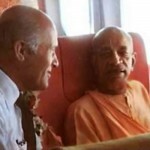 Prabhupada: Then you cannot say that the Vedic explanation is wrong. If you don’t know what gold is and a friend gives it to you, saying, “Here is gold” how can you deny it? You have no knowledge, therefore you cannot claim it is not gold. Similarly, if you don’t know what the Absolute Truth is, what grounds do you have for denying that Krsna is the Absolute Truth? If you don’t accept our philosophy, then you must present your philosophy. But if you don’t have a philosophy you must agree to hear from an authority who does. Devotee: Yes, that argument is logical; we should at least listen to you. But we have heard so many versions of the “truth.” Why should we accept your version? Prabhupada: That is like saying, “I have come across so many counterfeit coins, why should I think there is a real coin?” No. Because there are counterfeit coins, therefore there must also be genuine coins. It is our misfortune that we are unable to distinguish the real coins from the counterfeit ones. Devotee: You say that you are presenting the Absolute Truth and that the Absolute Truth is God, Krsna. But I think your position is dogmatic. There are many truths, many gods. Defeated! Students delight in a well-turned phrase from Srila Prabhupada during a mock debate. Prabhupada: The Absolute Truth is one; God is one. God cannot be many. If God has competition He cannot be God. If you don’t admit Krsna is God then you present who God is. But if you don’t know who God is or what God is then you cannot say that Krsna is not God. If you speak that way then you are being dogmatic. You do not know what God is, yet dogmatically you are saying that Krsna is not God. Therefore, we say that those who deny the supremacy of Lord Krsna are members of the owl civilization. The owls never open their eyes to see the sun. This is the unfortunate defect of conditioned souls; they demand to see God, but when God comes before them personally, or when He sends His pure representative, they cannot see. On The Plane From Denver To Chicago Srila Prabhupada scanned the lead article in an international news magazine entitled, “Crime: Why and What to Do.” He noted that the overwhelming problem was lucidly presented, but that no practical solution was offered. So, in Chicago, when the local mayor, a representative from the police force and a state assemblyman came individually to visit Prabhupada, he spoke to them for three consecutive days about the Krsna conscious solution to the problem of crime. Mr. Porter: I understand you were speaking to some police officials about crime. Prabhupada: Crime means anything you do without Krsna consciousness. It is simply a question of degree. Material life is criminal life. Everyone is busy. So many cars are going this way and that, here and there, but ask anyone what is God, he’ll be disturbed; “What is this nonsense?” He thinks it is a waste of time to talk about God. But one in spiritual life is only interested in God. Actually, human life is perfect when one remembers only God. Mrs. Porter: Can you live a spiritual life outside the temple? Prabhupada: Yes. 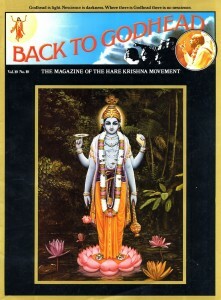 It is a simple method: chant Hare Krsna. You can do it anywhere, even while walking on the street. There is no tax, no loss and you can develop your spiritual life. Is it difficult? You have a tongue, you can chant. Do it and see the practical result. The temple is a place where you can come once in a day and get inspiration. But if you have no time, you can chant the Mahamantra anywhere you are and gradually make advancement. If you have more time, you can read our books. Mr. Porter: Christians have the concept of original sin and salvation. What is your view of that? Prabhupada: As I mentioned, anyone who is in the material world is criminal. It is like a prison house—everyone there is a criminal except the officers. Everyone in the material world is sinful to some degree. Those who are completely purified understand God, love Him and go back home, back to Godhead. In different countries, at different times and under different circumstances, there are different religious principles and methods of purification. Just like in the Christian religion there are ten commandments how to become pure. But if you do not follow them and still say that you are Christian, that is hypocrisy. If you follow the instruction given by God or God’s representative, then you are religious; but if you don’t follow, simply to say, “I am Hindu, I am Christian, I am Muslim,” has no meaning. The main business is how to understand God. “Krsna Himself says, ‘I can be understood only by devotional service, sincere service.’ It is very easy to learn this art; there is no distinction as to caste, creed, color. Now so many people are loving Krsna. One doesn’t have to be expert in philosophy or science or be very rich and intelligent. No. Simply love Krsna. Professor Thomas J. Hopkins is the Chairman of the Department of Religious Thought at Franklin and Marshall College. 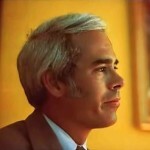 He wrote his doctoral dissertation on the Srimad-Bhagavatam and has been closely following the Hare Krsna movement since its beginning in America in 1966. For these reasons Professor Hopkins has long been anxious to meet with Srila Prabhupada, and in Philadelphia he finally had the opportunity. Dr. Hopkins: Of all the things which you have written, which is the most important? Prabhupada: The most important thing is how to love God. 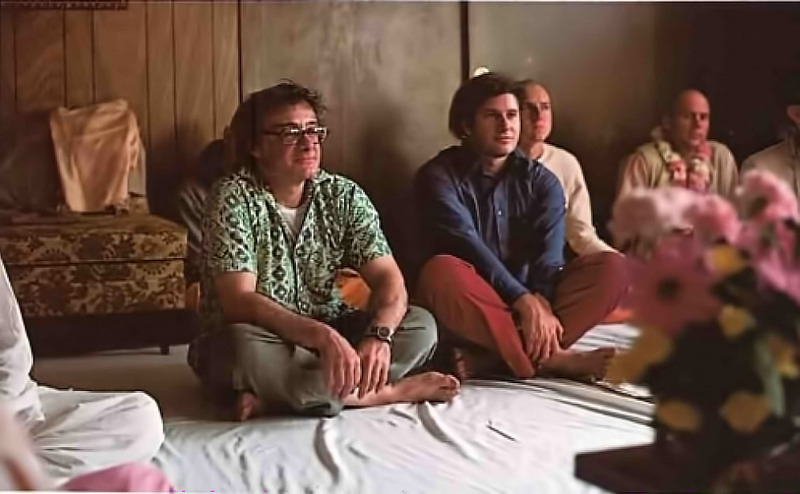 Early days of ISKCON are fondly recalled by Srila Prabhupada, devotees, and Prof. Thomas J. Hopkins of Franklin and Marshall College. Dr. Hopkins: But which book? Prabhupada: The Vedanta philosophy; first the Bhagavad-gita, then the Srimad-Bhagavatam. Dr. Hopkins: But is there one of the translations or purports which you would want everybody to read? Prabhupada: Yes. The Bhagavatam says that the ultimate goal in life is how to become liberated, not how to develop economically. (Bhag. 1.2.9) We should just get money honestly, not for sense gratification but for the necessities of life; to fulfill the bodily demands, not artificially to create them. Why? Because the ultimate goal is to attain liberation. It is not to make a new model car every year. We should not work hard day and night and go to church for material profit, praying to God to get money. People want material gain because they have no spiritual information; therefore they are described as “mudhas,” fools and rascals. If I take care of my shirt very nicely but I do not care for the person inside the shirt, then what is my position? Similarly, this whole material world is busy taking care of the body, not the soul inside the body. Therefore, all these so-called educational institutions are blind. It is a society of the blind leading the blind. Dr. Hopkins: What is the solution? Prabhupada: First of all understand you are spirit. Find out what is your relationship with God and act accordingly. That is the perfection of life. Evening Study Session. A devotee assists his spiritual master by citing pertinent scriptural evidence . 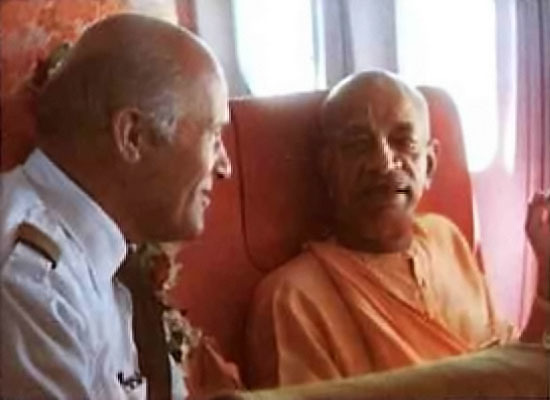 The Captain Of The United Airlines Jet that took Prabhupada from Philadelphia to Berkeley, California, took advantage of the long flight to talk with His Divine Grace. 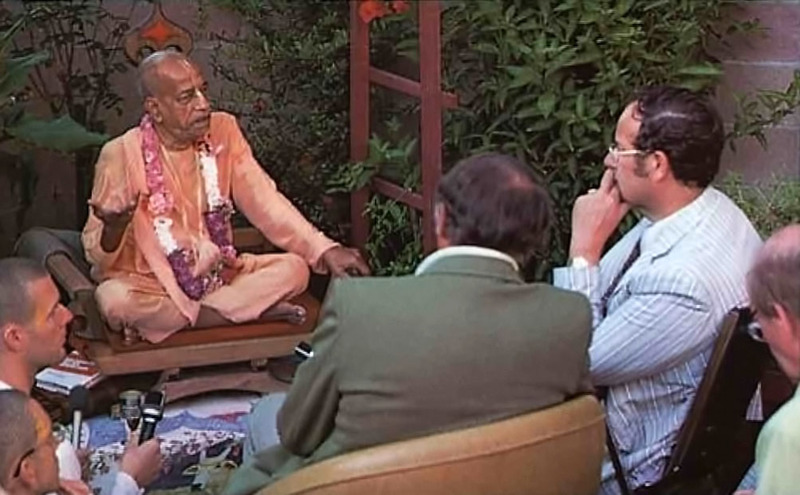 Later on, Prabhupada recalled the conversation. The captain asked that if God is all good, then why is there evil in the world? “I explained that for God there is no evil, just good. Just as my chest is as important to me as my back; if there is pain in my back I take care of it. I do not ignore it thinking that the front is more important. Evil is compared to the back of God. It is not different from His front, or goodness. The captain inquired further, “How is it possible to attain peace?” Prabhupada replied, “By understanding that God is the supreme proprietor, the supreme enjoyer, and the supreme friend.” Prabhupada explained these three aspects of God in detail, and showed the captain a few of the sixty volumes of books that have been published by the Hare Krsna movement on the science of God consciousness. A Professor Of Anthropology, Dr. James Freeman of the California State University, and some of his students paid a visit. The discussion turned to the reason for all the different species of life. Srila Prabhupada began, “The basic defect is that scientists do not know that the soul is different from the body. According to my activities I get a different body. The body is like a dress. According to the price you pay [your activities] you get a different dress [body]. For example, when you go to court, you are punished or rewarded according to your activities. The judge is impartial; it is your activities that determine if you are punished or rewarded. The supreme judge is the Supreme Lord. The conversation turned to politics. Prabhupada’s arguments persuaded everyone present that democracy was not the best form of government. “The common man has no sense whom to elect; he proves this by electing an unqualified leader and later trying to change him or pull him down. Meanwhile, thousands of bureaucrats live off the taxes of the people and spend their time planning how to keep themselves in power. … Srila Prabhupada explain the law of karma. Swami Chidananda, President of the Divine Life Mission, and some of his young followers sat before Prabhupada one afternoon and expressed their opinion about the merits of hatha-yoga, which is a process of different bodily exercises. 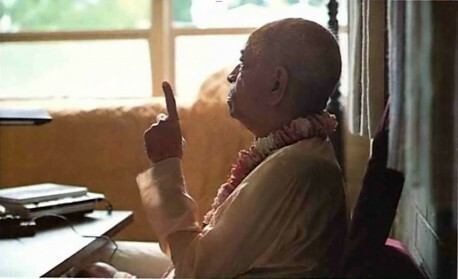 Prabhupada explained that the idea of making spiritual advancement by manipulating the body is wrong because, “I am not the body, I am spirit soul.” Bhakti-yoga, the process of linking up with God through devotion, begins with the proprietor of the body, the spirit soul. Other yogas, including hatha-yoga, begin on the material platform by prescribing different ways to control the senses artificially. But this is very difficult in this age. Even Visvamitra Muni, a very great yogi of the past, fell down after meditating for many years because he became attracted to a woman. Similarly, nowadays so-called yogis cannot control their sexual urges. Srila Prabhupada continued, “It is described in the Srimad-Bhagavatam that in this age of quarrel and hypocrisy men have short lives. They are quarrelsome, lazy, misguided, unlucky and above all always disturbed. (Bhag. 1.1.10) Therefore, this yoga practice will never be successful. Swami Chidananda agreed that all the great saints tended to emphasize bhakti and that even his guru brought chanting of the holy names to many parts of India. 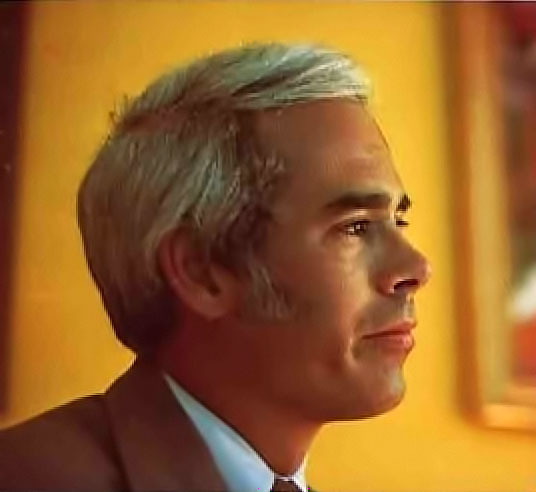 A Practicing Clinical Psychologist, Dr. Allan Gerson, had been testing devotees in the Hare Krsna movement to convince his colleagues of the validity of Krsna consciousness. His tests showed that devotees are markedly calmer, milder, more unbiased, and freer from anxieties than non-devotees. When he came to see Prabhupada in San Francisco, however, Prabhupada explained that since the soul is beyond the body, mind and intelligence, psychology does not apply. 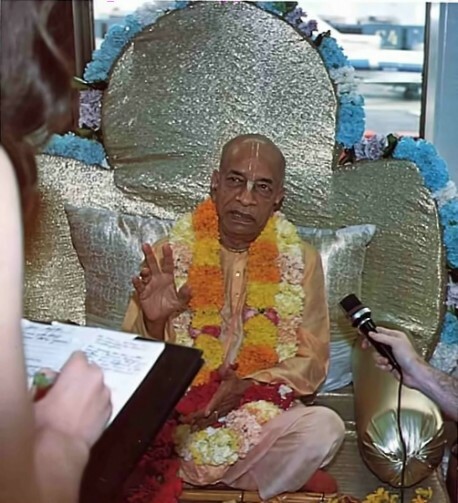 Prabhupada: “Yes, these tests may show this, but they will not give you any help. A diseased man will have certain symptoms, and a healthy man will have certain symptoms. Our goal is not to study the symptoms; we want to touch the origin of the disease and clear it away. 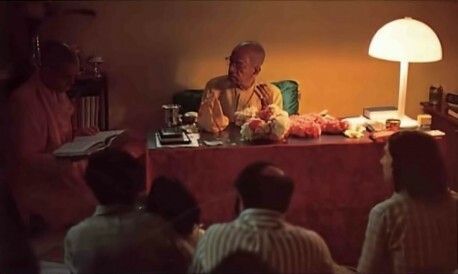 During His Morning Walks in Los Angeles, Srila Prabhupada took pleasure verbally sparring with his disciples by refuting their various atheistic arguments. As he spoke, the devotees would gather around him, straining to hear his soft voice over the ocean waves. Prabhupada: Everywhere the spiritual touch is required before matter will work. (A computer needs a person to push the buttons, a watch requires someone to wind it or put the batteries in it, etc.) In the same way, there is a brain behind nature, but because material scientists cannot imagine this brain, they say creation takes place by chance. Is it a very good explanation that by chance certain chemicals came together and there is life? The whole problem is they cannot distinguish between matter and spirit. Devotee: But scientists can point to so much progress they have made—time and laborsaving machines. Devotee: How do we know Krsna’s words are true? Is it simply blind faith? Disciples gather around His Divine Grace at Venice Beach in Los Angeles to hear their guru ‘s timeless teachings. 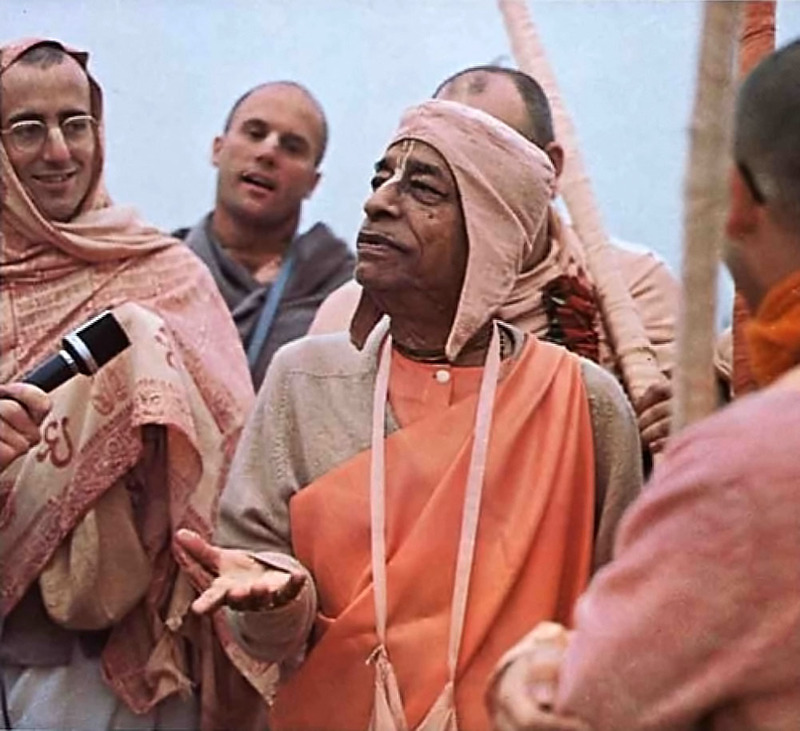 Prabhupada: No, not blind. Just as I know that on the other side of this ocean is Japan. I may never have been there, but I believe the authorities. Everyone without exception must have faith in something. You have faith that when you give your money for an airline ticket, you will get to your destination. Similarly, I am walking, I do not know the way, but someone I trust tells me, “Now go this way…” I have faith that this person will direct me properly. According to our purity we have faith in different authorities. Faith in the scriptural authority will grow with good association. You don’t need to have knowledge to have faith in God. Simply by having such faith knowledge will come. Krsna will give you knowledge. And how to begin this whole process? By hearing from a self realized soul, by chanting Hare Krsna, and by taking Krsna prasada [food which has been offered to Krsna with devotion]. It has nothing to do with the mind or intelligence or any other material condition. But if one has no faith, not even enough to hear and chant, then he must remain in this world of birth and death.